Flensted Mobiles- Sundrop Crystal Gifts The Juggler’s Apprentice! The master, with five large balls forming an elegant rainbow arc over his head, and the apprentice, trying to emulate him but with only one small ball, but "Practice Makes Perfect". A great lesson for us all to remember! Never give up! Meanwhile, enjoy this humorous and colorful cheery mobile! Flensted Mobile- Noah's Rainbow Noah’s Rainbow! 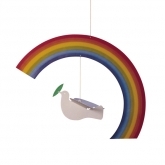 The rainbow and the white dove of peace carrying an olive branch. 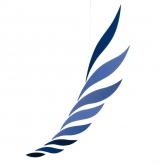 A beautiful comforting symbol of a better and more peaceful world. Flensted Mobile- Dolphins Dolphins! Three lively dolphins leaping in their dolphinarium (aquarium for dolphins!) to play with brightly-colored balls. A perfect mobile for the bathroom. Enjoy while you play in the tub! Great for a seaside window or to pretend you have one! Flensted Mobile- Teddy Bears Floating Teddy Bears! Four adorable teddy bears floating with their umbrellas, as in a dream. The perfect mobile for a child. 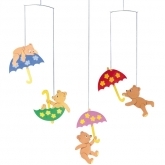 Fanciful and lovable, the little bears sway and swing with their umbrellas. The colors fit in any room. 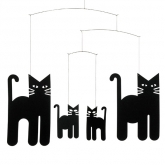 A great sleepy time mobile to hang by your child’s bed. Wonderful thoughtful lasting gift! Flensted Mobile- Atom Niels Bohr Atom Model Mobile! 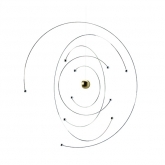 To celebrate the 100 years of the revolutionary Niels Bohr Atom Model, this beautiful mobile was created in cooperation with the Niels Bohr Institute of Copenhagen. In 1913 Niels Bohr developed his revolutionary model of the atom, from which new information technologies continue to arise, from the transistor radio to quantum computers. 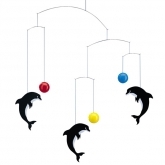 This great mobile will decorate any home. Make a scientist happy with a gift of this atomic model! Flensted Mobile- Elephant Party Elephant Party! 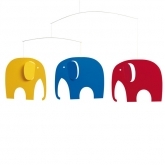 Best Seller!Three huge elephants. A red one, a yellow one, and a blue one comfortably trundling along together. With the mobile are three baby elephants (not suspended) suitable for bookmarks, etc. The ideal gift for a baby. Elephants party by getting into bright colors! Flensted Mobile- Angel Family Angel Family! Angels protect and guide people on their way. 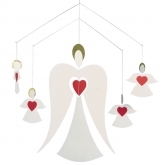 This mobile consists of an entire angel family that will help create a relaxing atmosphere and spread the Yuletide spirit to every corner of the house. For the rest of the year, this family of angels can watch over anyone you would like to send them to! Condolences? Get Well? Love? These Angels will be pleased to carry your message! 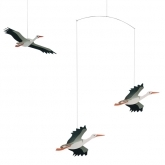 Flensted Mobile- Lucky Stork Danish Lucky Storks! The very first Flensted Mobile - Three Lucky Storks. In 1953 Christian Flensted cut 3 storks in cardboard and mounted them in 2 sticks of straw. An ideal greeting to send to the expectant mother - or a welcome to hang above the crib of the new infant. Packed in an envelope - easy to send. Fabulous Gift! 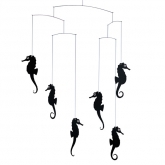 Flensted Mobile- Seahorses Seahorses! Three seahorse couples in perpetual motion, engrossed in all that takes place around them. Did you know, by the way, that seahorses mate for life, and in the seahorse world it is the male who becomes pregnant? Enjoy these wonderful beautiful creatures flitting and floating for you! Flensted Mobile- Sea Lions Three Happy Sea Lions! The perfect mobile for a bathroom. 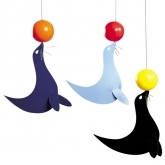 Three colorful, playful Sea Lions frolicking! The three dimensional spheres make it visible from underneath. Constructed of foil, so it can withstand humidity. Wonderful to enjoy in any room as the cheerful, colorful mobile gently moves. Fun! Flensted Mobile- Angels Angels! Beautiful! 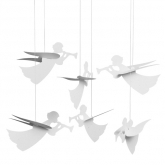 A simple, old fashioned yet beautiful mobile of six white Angels. They have trumpets and can herald the joy of Christmas or other Holidays! Or, they can bring comforting Get Well Wishes or Condolences. They can protect and brighten the day of someone who just loves Angels! Like all of the mobiles, the angels are nicely packed, and they can be put away year after year. Pack carefully, and it can hold up for ages. Get your Special Angels Today! Flensted Mobile- Turning Leaves Turning Leaves! Best Seller! Cascade of Leaves falling down gently. Dramatic Black and Red Color. Consists of 10 "fish" hanging under each other. A fantastic mobile in a corner or narrow place. A high down-falling mobile. Fabulous! Flensted Mobile- Swallows Swallows! Best Seller! 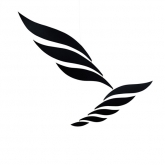 Three Swooping Swallows! 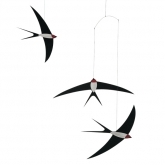 Hang this mobile over your bed or sofa to recall the elegant flight and clever aerobatics of the incredible, beautiful, Swallow. Remind yourself or a friend of these wonderful tiny birds! Enjoy! Flensted Mobile- Cyclephants Cyclephants! What? Cycling Elephants! Four young elephants having fun on their bicycles. How Silly! Part of the income from sales of this mobile is donated to "Save the Children, Denmark". Enjoy this Wonderful Whimsy! Flensted Mobile- Circus Circus Clowns! What is more fun than a circus?! This reflects the heart-warming story of how Bubi (pronounced "Booby"), as a stray dog, found a home and became a member of a world-famous troupe of clowns. Children love this mobile. A Fun and Cheerful Gift! Flensted Mobile- Penguins Penguins! Six gentlemen penguins at a serious summit. Obviously they have important things to talk about! Watch them waddle around! A mobile for all lovers of one the most amusing animals in the world. Get Yours Today and Enjoy! Flensted Mobile- Air Planes Air Planes! Best Seller! 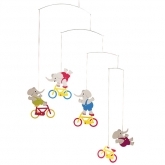 This very charming 3-dimensional mobile is very popular. Children love air planes. Part of the "CLICK-A-MOBILE" series. This mobile is mounted on strings and pre-assembled with the hanger system. You just need to click the single elements together. A semi-assembled mobile. Spend fun time with your child to put it together! 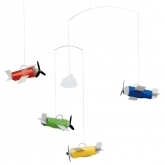 Enjoy these charming colorful Air Planes flying in your home! Flensted Mobile- Doggy Dreams Doggy Dreams! Who will catch that "wishbone" in the center? Four playful puppies frolicking in the lightest breeze are all hopeful. A Fun and Cheerful Gift! Flensted Mobile- Feline Fun Feline Fun! Best Seller! Behold the ever fascinating cats. 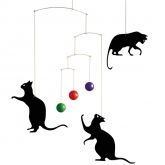 They will twist and turn, but will they ever catch the colorful balls? Inspired by a lithograph by Théophile Alexandre Steinlen. Order Today and Enjoy! Flensted Mobile- Cats Cats! The fascinating shape of the cat has been captured in a lively mobile. Two cats and their two kittens move gracefully amongst each other. The ideal mobile for the cat lover. Kitties that don’t shed! Yay! Flensted Mobile- Dinghy Regatta Tiny Sailboats! Best Seller! Enjoy the Sailboat Race! The Dinghy Regatta is out for a Great Sail! 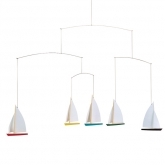 This mobile, with dinghies maneuvering amongst each other, evokes the pleasures of a day at the seaside. The perfect gift for sailors of all ages. Bring the summertime inside for the winter! Have some sailing smiles all year round! Choose Three Boats or Five Boats! Flensted Mobile- Happy Frogs Happy Frogs! Love Frogs? They are amazing creatures. 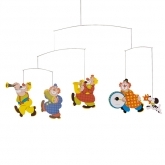 This funny mobile is best seen from below, so it is ideal for hanging over a child’s bed. It would be great for a window overlooking woods or a stream or pond! These five frisky frogs will simply make you smile! 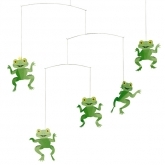 Cheer someone up with a gift of Happy Frogs! Flensted Mobile- Horses Horses! A mobile for the horse lover. 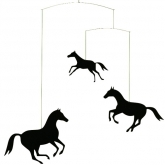 Exquisite lively silhouettes of frisky horses! Wonderful way to dream about horses when you can’t be there! Thoughtful Gift! Flowing Rhythm! LARGE Enjoy an interplay of shape and color in movement that is perfectly suited to the contemporary interior. This mobile is Red on one side, and Black on the other. Created in 1955 by Christian Flensted. 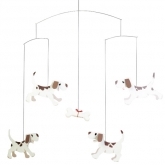 This popular mobile is available in a glorious LARGE size. Special Order Only. We do NOT have this in stock. We are happy to get it for you when you order! Remember to allow some extra time. Enjoy! Rhythm! SMALL This elegant mobile is made from aluminum. It makes the Ideal Gift for Special Occasions. The size is 72 cm high and 70 cm wide (29 x 28 inches) but it needs a diameter of at least 85 cm (34 inches) to turn freely. Very Special! Four Colors! Special Order Only. We do NOT have this in stock. We are happy to get it for you when you order! Remember to allow some extra time. Enjoy! Rhythm! MEDIUM This elegant mobile is made from aluminum. It makes the Ideal Gift for Special Occasions. The size is 97 cm high and 95 cm wide (39 x 38 inches) but it needs additional diameter to turn freely. Very Special! Three Colors! Special Order Only. We do NOT have this in stock. We are happy to get it for you when you order! Remember to allow some extra time. Enjoy! Rhythm! 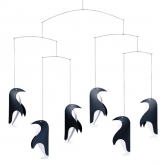 LARGE This elegant mobile is made from aluminum. It makes the Ideal Gift for Special Occasions. The size is 122 cm high and 120 cm wide (49 x 48 inches) but it needs additional diameter to turn freely. Very Special! Three Colors! Special Order Only. We do NOT have this in stock. We are happy to get it for you when you order! Remember to allow some extra time. Enjoy! Appreciate the small things in life- One day you will realize that they were the big things! In 1953 Christian Flensted of Denmark made his first mobile to celebrate the christening of his daughter. He cut out three storks, mounted them in two straws, and the Stork Mobile was made. This was the beginning of a beautiful adventure! The Flensted company was founded in 1954. That means that 2014 celebrates 60 years of bringing balance to the world through movement. A Flensted Mobile is made from a perfect combination of love, dedication and quality, bringing a beautiful, unique design into your home. Seize the moment- but remember to unwind! In the fast-paced world in which we live, we put a lot of energy into fulfilling our hopes and dreams. In order to do so, we must gather strength and relax, so that we can fully seize the moment. Observing a mobile can produce various moods, including excitement, pleasure, and inner peace. It will have the same soothing impact on you as watching a sunset or listening to the birds outside your window. 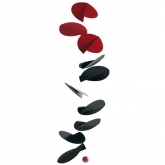 The mobile simply creates serenity­­­ through its graceful and almost therapeutic, calm movements. Have a moving yet balanced life. Why not treat yourself or your loved ones with a gift that will last a lifetime and bring beauty into any home - and at the same time help you, and your loved ones, to unwind? Flensted mobile makers, like the mobiles, are always on the move! What is a Mobile? 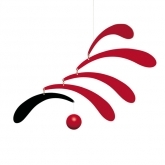 Visit here to learn all about the history, tradition, and making of Flensted Mobiles. The best way to unwind? 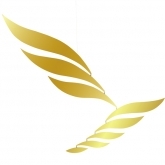 ~ Watch a Flensted Mobile!